It was such a pleasure to see Kiki the little girl that lives with her mother and her brother in our team house in Banda Aceh, running around and being an inquisitive child. Kiki has been walking for about two months. I last saw her in October when she was still crawling. 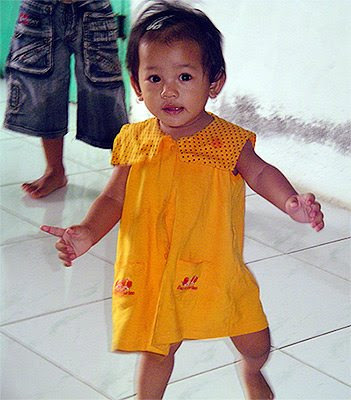 When I arrived back in Banda Aceh, we found her not only walking but running and around the house, screaming with joy and laughter. You see it was a pleasure because Kiki almost wasn’t born into this world. 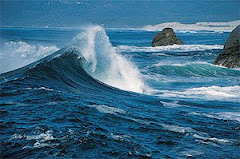 Her conception was a result of the tragedy of the tsunami of 2004. Her mother and brother had to move into the relocation barracks at Camp Mataie near Banda Aceh, as their home was destroyed by the wave. While their Kiki was conceived out of wedlock and almost done away with, our team member Santy was able to intervene in time and convince her mother to continue the pregnancy. Today Kiki is loved by all of us at Asian Children’s Relief Fund. We don’t know what the future holds for her and her family but she does know the love of God through all of us who love her very much. Please continue to pray for Kiki, her brother and her mother. In Jantho the community leader and the ladies affirmed that we are doing what they would like to see in their communities. They want additional help with cooking, sewing & embroidery classes. They also indicated they want computer training, English language training not only for the children but also for themselves. The village leader is fully supportive of all this. This opportunity presents over 350 families that can be helped. Mercy Teams International also came to visit and is interested in helping to fund fish ponds and various agriculture projects. This could happen in the spring of 2008. We also had some people stop and visit who might want to join us in the work by the summer and help in Riting and Jantho. After that I was able to receive the major shipment that left Malaysia on the 26th from our home in Seremban. We hope to increase the number of sponsors for our children in Banda Aceh and Medan. There are 56 who have funding thus far of the approximately 190 we have registered. More are waiting to register with us. Outfitting of four buildings for widow and orphans ministry, three in Lhok Nga and one in Jantho. Connect Lhok Nga to water source. Start widow training in Jantho in January. Our team will move in February. First of all Mena took off to Los Angeles to help with the delivery of our sixth granddaughter. Then I started to pack up the house in Seremban and get it ready to ship to Indonesia. 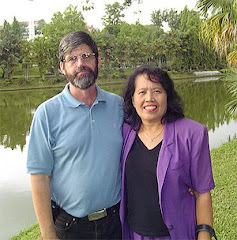 In the middle of that I had to leave to attend a Cutting Edge Conference near Bangkok for Children at risk 19-22. After settling the shipping and bills and stuff, I stayed with a friend, went to K.L. to have a couple of meetings it was back to Seremban and then to the airport for the flight to Medan, where I was able to visit the children’s home.